Digital Economy Metrics - Analytics that work for you | Strategic Networks Group, Inc.
Economic and community benefits from broadband and digital infrastructure investments can be planned, managed, and measured. This is exactly what Strategic Networks Group has been doing for almost 20 years: we collect and analyze data from businesses, organizations and households to assess broadband demand and maximize impacts from investments in digital infrastructure and transformation. How is broadband being used? By whom? Can digital infrastructure be used in more impactful ways? What are the gaps and what insights can be learned to inform steps forward? Does investing in digital infrastructure investment pay-off for our community? Can this be self-financed? What are the measurable benefits of digital infrastructure to the community and how can they be personalized to local residents, businesses, and organizations? SNG has amassed an industry-unique database of more than 75,000 households, businesses, and organizations across North America (including statewide broadband demand assessments for nine American states) and in Europe. Our normative database on broadband demand has enabled us to develop key insights and tools to drive local economic growth and realize community benefits through broadband. Moreover, quantifying the community returns from digital infrastructure investments focuses attention on expected outcomes, which helps prioritize goals and becomes a driver for engaging local stakeholders and organizations. The first step in any analysis is to assess the current state across the community or region. SNG uses this data as a baseline to identify gaps, opportunities, and barriers to broadband demand that need to be addressed. Analysis of benchmark data enables us to develop a future state and use that to estimate the potential impacts and benefits of investing in digital infrastructure and transformation. Additionally, key metrics and demand profiles from our database enables us to also develop insights on how to drive demand and digital transformation. Finally, measuring project performance against the baseline enables us to assess progress toward desired outcomes, as well as make recommendations to adjust plans and programs to address evolving needs. As the saying goes, you can’t manage what you can’t (or don’t) measure. 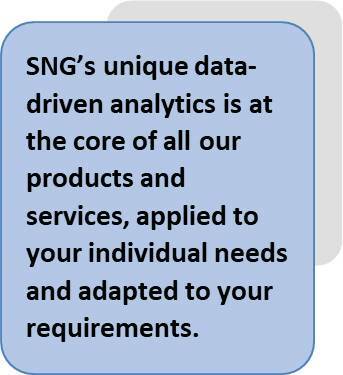 SNG’s experience in data collection, benchmarking, and years of analysis ensures that you will have the right data and insights to make the right decisions at the right time. Our experience also enables us to conduct the data collection in a very cost-effective way with participation rates three to four times above the industry average. SNG offers a range of solutions for different client needs, whether you are a community just starting to explore how to improve your broadband status quo, a municipality, utility, or broadband provider looking to get more from your network investment, or a region or state government needing fact-based evidence to formulate strategies and programs. In all cases we strive to match our research and analytics to your unique needs to provide you with actionable intelligence. 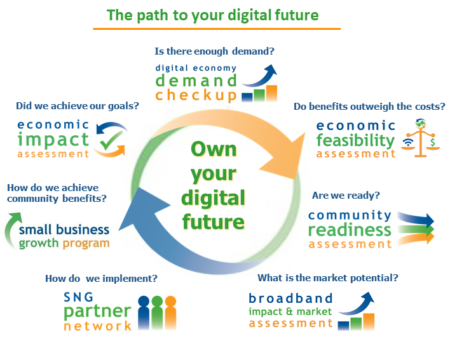 Digital Economy Demand Checkup – helps localities answer the question – do we have enough demand for an investment in broadband and digital infrastructure? The service is designed to be a practical and cost-effective way for localities to assess whether there is an addressable market when considering broadband and digital infrastructure investments. We provide SNG’s industry-leading digital economy metrics and data collection tools for localities to gather demand data directly from residents, businesses, and organizations. Economic Feasibility Assessment – is a cost-benefit analysis of community benefits versus an alternative to longer and more costly broadband feasibility studies. It is foundational to a sustainable broadband project and the first step in planning because it answers the key question: Does this digital infrastructure investment pay off for our community / region? Our analysis goes well beyond the typical service provider business case financials to quantify the impact your investments can have on citizens, businesses, and your community in terms of municipal cost reductions, subscriber savings, economic growth, and smart community benefits. Community Readiness Assessment – Municipalities that have decided to move forward in owning their digital future need to ensure that they are as ready as possible to achieve successful outcomes. Getting from your vision to outcomes can be a multi-faceted process that involves partners and stakeholders in the community. Engaging these stakeholders early not only involves them in the process to achieve consensus and support across the community, but it also provides valuable input from a wide range of perspectives. SNG’s Community Readiness Assessments provide easy-to-use online tools to invite key stakeholders in your community to participate in evaluating readiness, affirming strengths and revealing gaps that need to be addressed to ensure success. Two versions of the assessment are available. The Community Broadband Readiness Assessment is tailored toward broadband digital infrastructure initiatives, while the Smart City Readiness Assessment focuses on smart city initiatives. Broadband Impact and Market Assessment – Municipalities and utilities that are planning or have already established a network need to ensure that it is both sustainable and delivers the desired social and economic outcomes. Sustainability of operations ensures that the network can grow and meet the needs of the community, so understanding community needs and demand for services is essential. In addition, knowing how the network is used and how you can influence these uses that delivers the benefits and impacts from your investment. The Broadband Impact and Market Assessment establishes your own data benchmark around demand and uses of broadband to inform your planning decisions and to assess how to get the most out of your network. Your own benchmark also provides the base for measuring progress and outcomes from your efforts. Small Business Growth Program – Small businesses are the often-overlooked drivers of local economies, both through their own business activities and through the jobs they create as they grow. SNG research has shown that the more effectively businesses use broadband for online applications, the faster they grow by being more relevant, productive, and competitive. 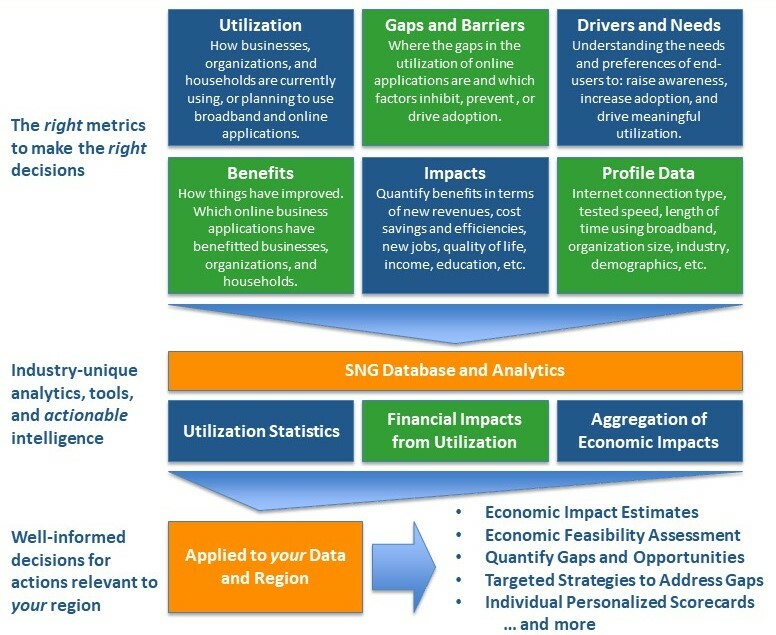 The Small Business Growth Program applies SNG analytics to show individual businesses what more they can do online, and why it matters to their bottom line, in a way that is relevant to them. We know that small businesses, as well as our clients, have many priorities, which is why the Small Business Growth Program includes valuable easy-to-use online tools to educate and assist businesses and help our clients stay on top of progress. eSolutions Benchmarking – States and regions that understand the value of ubiquitous, quality broadband connectivity need the right data and analysis to get a clear picture of the current state of broadband and its use. Knowing where the gaps are and why, as well as the potential outcomes of closing those gaps, aids in creating effective strategies, plans, and programs. SNG has years of experience in working with state and regional-level clients to collect and analyze data cost-effectively and with above average participation rates. See more detail about eSolutions Benchmarking. Economic Impact Assessment – Whether it is building digital infrastructure or programs that put your digital infrastructure to work, you make these efforts and investments to achieve goals and outcomes for your community. Knowing how well you are achieving these outcomes provides essential feedback to validate actions to date and to adjust them going forward. This starts with defining meaningful and useful metrics from the outset and measuring them as you go forward. SNG has been measuring the uses and benefits from broadband and digital infrastructure for over 20 years using metrics unique in the industry. From day one our focus has been to help clients understand the economic and social impact potential from investing in this essential infrastructure. See more detail about measuring economic outcomes from your digital infrastructure and transformation initiatives. Ultimately, all of these services share a common goal that is at the heart of what we do: help communities get the digital infrastructure they need and get the most out of the broadband they have.